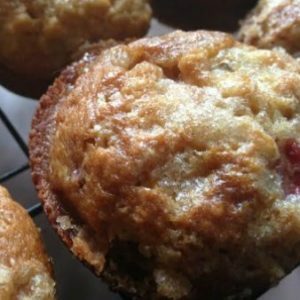 June 26, 2017 0 comments on "Strawberry Rhubarb Muffins"
If you are looking for a way to use up the rhubarb in your garden, then give these strawberry rhubarb muffins a try. They are like a miniature version of strawberry rhubarb pie. Yum! Preheat oven to 400 degrees. In a large bowl, combine sugar, oil, egg, vanilla, and buttermilk. Beat well. Stir in rhubarb and nuts. In a separate bowl, stir together flour, baking soda, baking powder, and salt. Stir into rhubarb mixture until just blended. Fill muffin pans 2/3 full and sprinkle topping on top. Bake for 20 to 25 minutes. Makes 20 muffins. 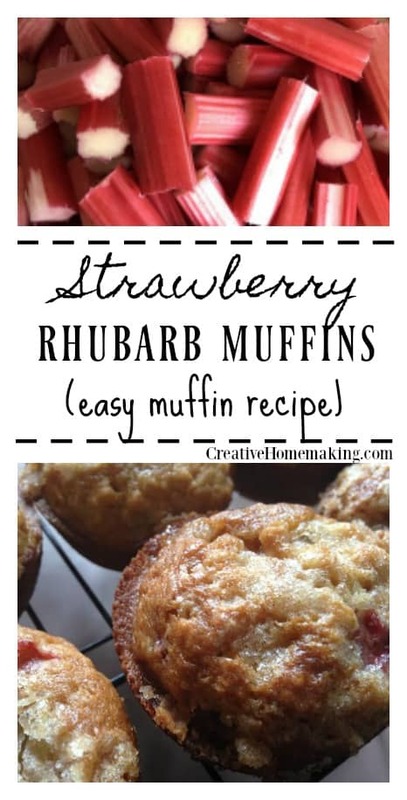 Note: If you want to just make rhubarb muffins, then leave out the strawberries and substitute rhubarb instead. You can also leave out the rhubarb and just use strawberries, substituting strawberries for the rhubarb. If you like this recipe, you might like my strawberry rhubarb jam or my strawberry rhubarb pie with crumb topping recipes.